It started off with matcha ice-cream and his many attempts to make it fluffy and smooth and creamy. Now it’s shiratama dango that he’s after and trying his hand at. Shiratama dango balls (or 白玉団子), is a kind of mochi that’s made using glutinous rice flour – not the typical kind that we find in the supermarket (which uses long grain rice) but mochigome, which is made from short grain rice. Most of the shiratama dango that we find in restaurants and cafes are served as a side or topping on ice-cream or other desserts, together with azuki red bean paste for example. The guy decided make his dango balls a little bit more special by adding the red bean paste into the dango balls so that they are tastier and nicer and more unique. I have no complaints though because I always get to enjoy the aftermath of his experiments (the matcha ice-cream was so nice!). This time round, I got to enjoy both the ice-cream and the dango balls as toppings to go with the ice-cream. 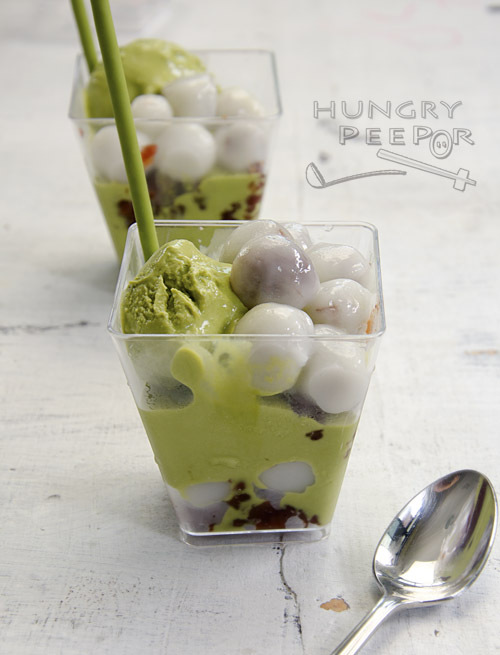 Yes, he made a tub of matcha ice-cream especially for this shiratama dango recipe! Yums! Combine glutinous rice flour, water and food colouring. Knead the mixture until it becomes a soft dough (like the feel of your earlobe). Divide the dough into approximately 40 – 50 portions. Press a small pinch of red bean paste into dough. Fold in the dough and roll into a small ball. Repeat for remaining dough. Prepare a pot of boiling water. Add balls into water and boil for about 1min till they rise to the top of the water. Scoop balls out of water and immediately place them into chilled water. Drain away water. 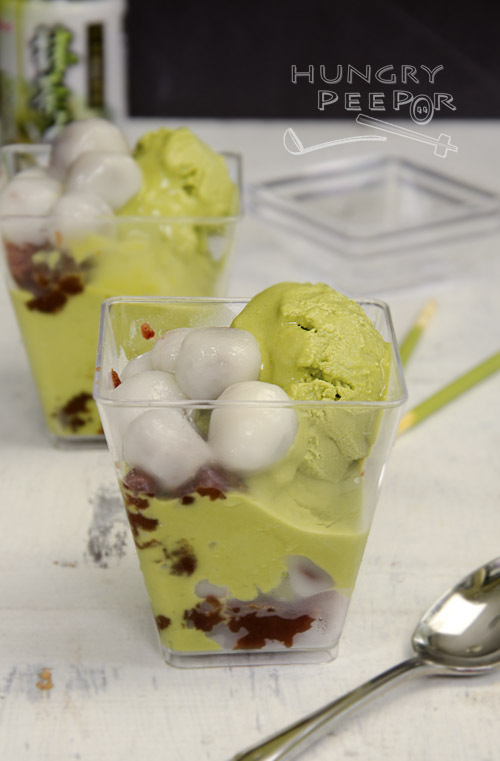 Serve with Japanese matcha ice-cream or with the Japanese Mitarashi sauce (soy sauce gravy). Instead of ice-cream, you can also serve the dango very simply with either a drizzle of honey or maple syrup or with a drizzle of mitarashi sauce (a soy sauce mixture). Yums! 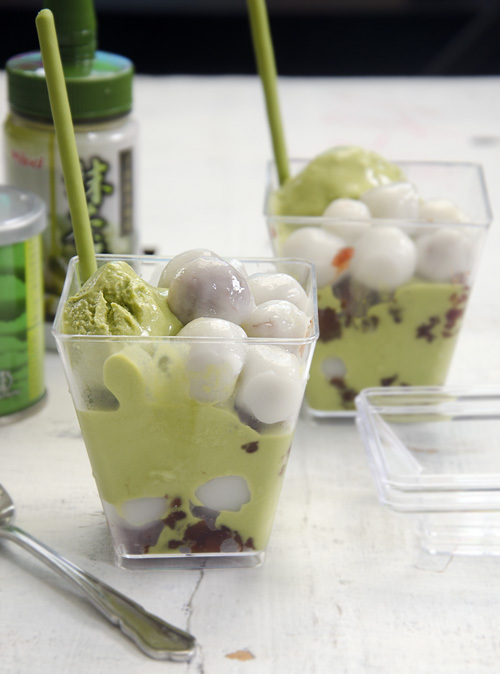 This recipe was kindly adapted from Oishii’s ‘The Versatility of Shiratama Dango‘. This entry was posted in Japanese, Snack and tagged Boiled, Dango, Dessert, Mochi. Bookmark the permalink.